There are many options to consider when it comes to home design. Whether you are redecorating, remodeling, or custom-building, you want to be happy with the materials you choose for years to come. We’ve outlined the design trends that we predict will remain strong throughout 2019, so you can be inspired to find the right amenities and style for your home. We’ve seen a mix of styles from eras throughout history, from the Renaissance period to the late 60s and 70s, resurfacing in 2019. Homeowners are incorporating rich, bold colors, floral and velvet fabrics, copper or brass fixtures, curvy-contoured finishes, geometric-patterned decor, vibrant wallpapers, and ornamental rugs. Some bring a touch of nature into their home with big, lush plants, reclaimed wood, concrete accents, and matte finishes. We’ve also seen a rise in warm, earthy tones like taupe and feminine hues like blush, along with dark, moody colors providing rich depth and a luxurious feel. A large range hood over the oven. For living rooms, we’ve seen a rise in hand-crafted influences with high ceilings, large, reclaimed wood beams, and arched French doors. Expansive great rooms with coffered ceilings, an architectural style inspired by the Renaissance era, are also popular. For bedrooms, canopy beds are making a comeback. From a simple, curtain-less frame to a sumptuously draped four-poster bed, this dreamy piece of furniture adds comfort and luxury. Many homeowners want large, spacious bathrooms with amenities for a spa-like experience. Freestanding tubs, open showers with no walls, electric fireplaces, and drying stations are some of the most coveted trends. Instead of deep mahogany or cherry wood vanities, simple, reclaimed wood vanities provide a lighter, more natural touch. For home exteriors, shake and shingle siding are a popular home cladding product. We also see many homeowners updating their old brick exteriors with mortar wash. In addition, statement garages, particularly with carriage style or stained wood garage doors, are becoming increasingly popular. 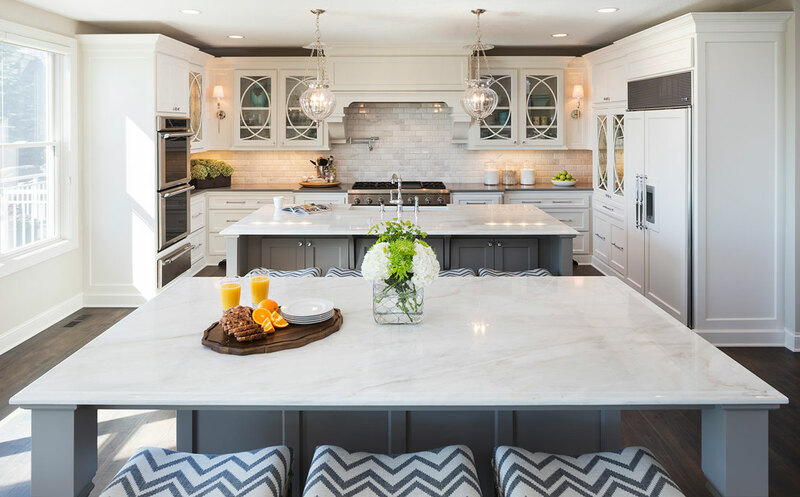 Wooddale Builders is Minnesota’s luxury custom home builder providing custom single-family homes, luxury villas and townhomes, and whole home renovations. Whatever trends you’re looking to incorporate, our expert team can provide the design and craftsmanship to bring your project from concept to completion. We’re proud to have received the Best of Houzz 2019 Award for Design! Download our brochure or watch our video to learn more about the benefits of partnering with Wooddale Builders for your custom home or renovations.